King Arms M1A1 Gold Thompson HI Grade Airsoft Rifle | ReplicaAirguns.ca | New Website! 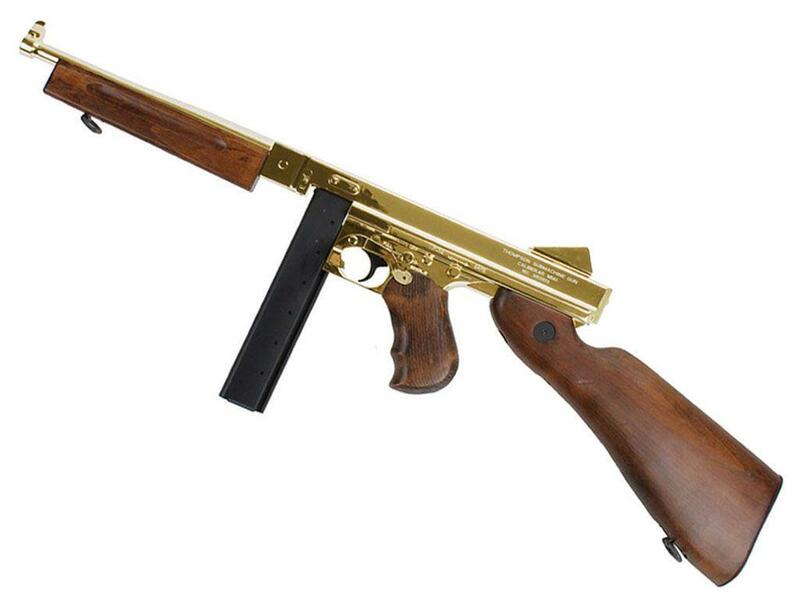 Comments: The Grand Special series Thompson M1A1 Military Gold is produced under official license. The surface finishing of this beauty is 23K gold plated and you can find the full laser markings and a unique serial number engraved on the receiver. It has real wood hand guard, grip and stock, and equipped with a 9mm bearing gearbox. The rear sight is adjustable as user's preference. An 8.4V large type battery can be store inside the stock and a 420 rounds magazine is included in the package. http://www.ReplicaAirguns.com - King Arms Thompson Gold M1A1 Military AEG Airsoft Machine Gun Field Test Shooting Review. -420 round stick or drum magazines. -Gold version is 23K Gold Plated. As per usual I do my Chronograph test along with my semi and full auto target accuracy tests out at 30 feet in a semi rested position. I also shoot some water filled cans this time around in full auto and capture it in slow motion using my new iPhone 5s 720p 120 frames per second feature. http://www.ReplicaAirguns.com - Thompson Gold & Chrome AEG Airsoft Rifle Update Video. We have some new arrivals in our Canada Replica Airguns Store that some of you who like the more flashy guns may appreciate! What makes a classic Thompson machine gun even better? First of all make sure it's got an all metal body, then add real wood furnishings and of course cover it in 23 karat gold platting or if you prefer a slightly toned down version, then go with the Chrome plating.